I heard about this site called Typealizer that gives you a Myers-Brigg type score by analyzing your blog. 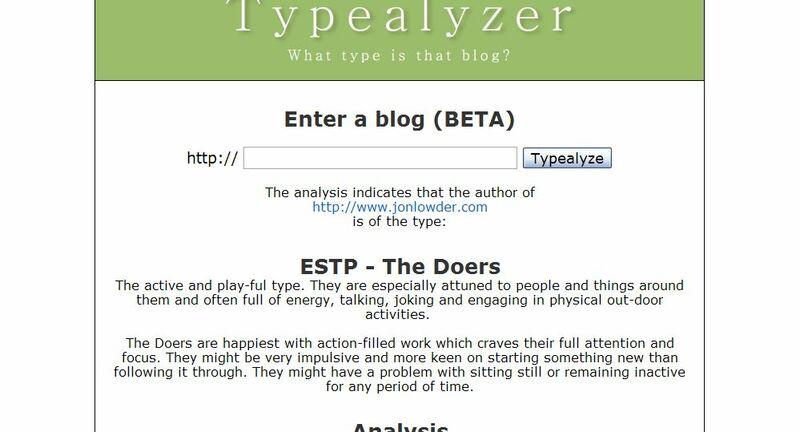 So I tested it and apparently I'm a "Doer" or in the Myers-Brigg vernacular I'm an ESTP. Click on the image to the left to see the results. While most of the description does seem to accurately depict me, I think that anyone who knows me would disagree with the whole "doer" moniker. I'm more of a "think about doing" kind of guy, unless of course the doing helps me avoid real work. I'm great at doing things like avoiding yard work, avoiding chores, avoiding washing the car, etc. If that's what they mean then they're dead on. This entry was posted in Navel Gazing, Weblogs on November 3, 2008 by Jon Lowder.